Recently, my company bought a compound microscope for our lab. I have doing some research and survey on how to choose a suitable one. So I would like to share some important factors to consider when choosing a compound microscope. But before that, let us know basic parts of a compound microscopes. Magnification size. It is the most important subject when choosing a microscope. Magnification size defined as the ratio of enlarged image to the size of original sample. It telling us how many times the microscope can enlarge the image of original sample. So when choosing a microscope, defined your sample’s size, the purpose and the magnification size that you need. Purpose and user. Usually a microscopes for elementary and high school students is more simple and cheaper as it usually just for introduction or for observation of plant cell or animal cell. The microscopes usually have at least 400 X magnifition powers. On the other hands microscopes for university students, pharmaceutical, veterinary, biology professional and for research purpose is usually more advance. 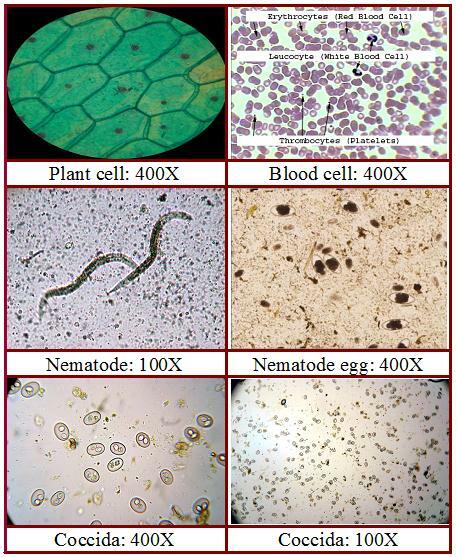 The microscopes have at least 1000-2500X magnification size complete with camera and microscopes software. 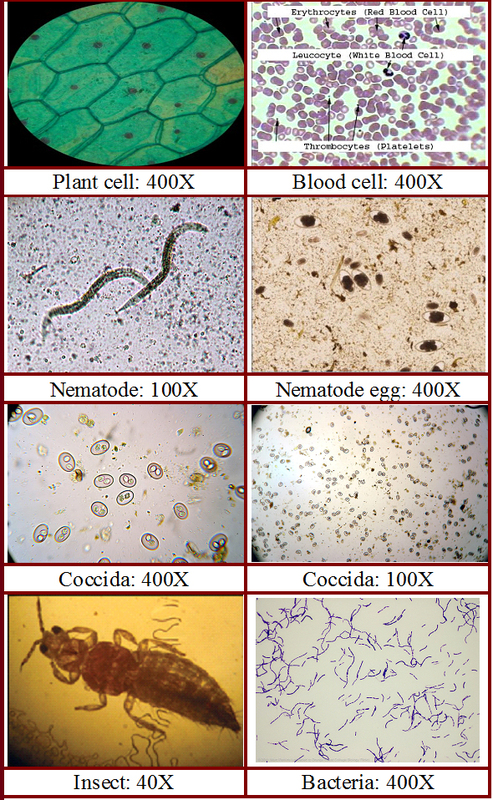 Example of samples, purposes with suitable magnification size is as in the table below. Power of eye piece and objective lens. It was the two types of lenses that work to produce image. Eye piece is the one that we use to see through the microscopes while objective lenses are the lens near the object. Eye piece usually presence in 10X or 25X power of magnification, while objective lens are 4X, 10X, 40X and 100X. The combination the power of both eye lens and objective lens give the total magnification of the image. Example of the combination is as in table below. Knowing the power of eye piece and objective lens is important for you to determined magnification size. Types of stage. Stage is the part of microscopes to place slides. You can choose a pin type stage or a mechanical stage. A mechanical stage is more users friendly where user can easily adjust the slides in the position they want and see the slide thoroughly while doing observation. 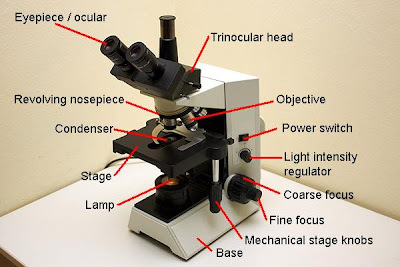 Monocular, binocular or trinocular microscopes. The three types will not effect on image result but it depends on the comfortibility of the user to choose how many eyepiece(s) suitable for them. Compare to monocular (single eyepiece), the binocular has two eyepieces which usually more easy to use as the brain do not have to choose the right or left different image seen by our eyes. On the other hand, trinocular microscopes also have only two eyepieces but have an extra vessel for external hardware such as camera. Microscope’s camera. Usually for research use a camera is important to keep picture or video of sample’s image which is important for documentation. If you buy a camera specific for microscopes, it usually comes along with complete software that enhance your analysis efficiency such as better image, measuring size and editing image. However normal camera also able to take picture and video of sample’s image. Just fixed your camera lens on one of the eyepiece and then zoom to the image to get picture or video. Source of light. There are few choices such as florescent, luminescent, LED and halogen light. Fluorescence and luminescent light is usually used for kids’ microscopes where it is yellow in color and less bright. Nowadays LED light is more popular as it gives white light, last longer, less sensitive and cheaper. On the other hands halogen lamp give bright white light but have short life and quite expensive. The halogen lamp also have very sensitive filament that it easily broken when there is movement while in used. So that are the important factors, however there might be other things you might want to consider such as price, material that make the microscopes, size or brand of the microscopes. I hope the tips can help you to find a suitable microscope for yourself. For me as I need it for microbiology research purpose, I prefer a trinocular compound microscope, have mechanical stage, image enlargement until 2500X magnification size, complete with microscope software and using LED light.